Trying to find a last minute table before the Blackhawks game, my friends and I stumbled across The Boundary Tavern and Grille. I had seen it several times whenever drinking in Wicker Park area, but had never stepped inside until now. We easily got a table half hour before the game started and decided to play a few games of shuffleboard. Once the game started, it was packed like a typical Blackhawks bar. Unfortunately, they had no drink specials despite being a weeknight game. They do have an extensive beer menu, but be aware... their draft list is quite small. The food was pretty good; and definitely fresh. When comparing this bar to other Blackhawks bars, I can only consider this one average. And for that reason, I decided on a 3.5-mile rating. With such an extensive menu, it was difficult to figure out which wrap/sandwich/burger I would eat. I finally chose the southwest chicken wrap. This wrap is made with adobo chicken, romaine lettuce, tomatoes, avocado, and a black bean relish. It is also filled with pepper jack cheese, tortilla chips, and a chipotle dressing. 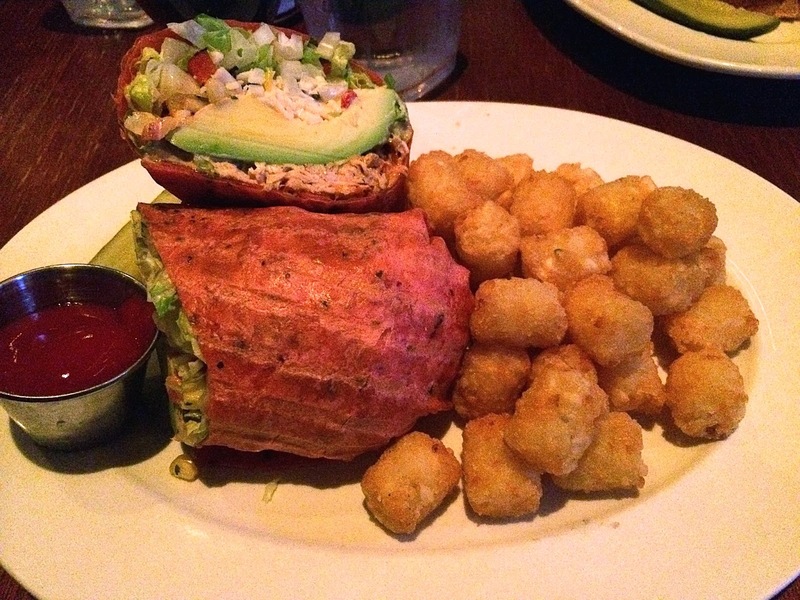 All of that is wrapped inside a tomato wrap and served alongside tater tots. It was delicious. There was plenty of vegetables to make it fresh and plenty of chicken to give it a strong southwestern flavor. I especially liked the first few bites because of that avocado slice. I didn't like the dressing too much and I thought they were a little heavy handed. Also, the wraps are a little deceiving... the ends are essentially empty so it appears much bigger than it truly is. The tots are freshly fried and are a perfect side. 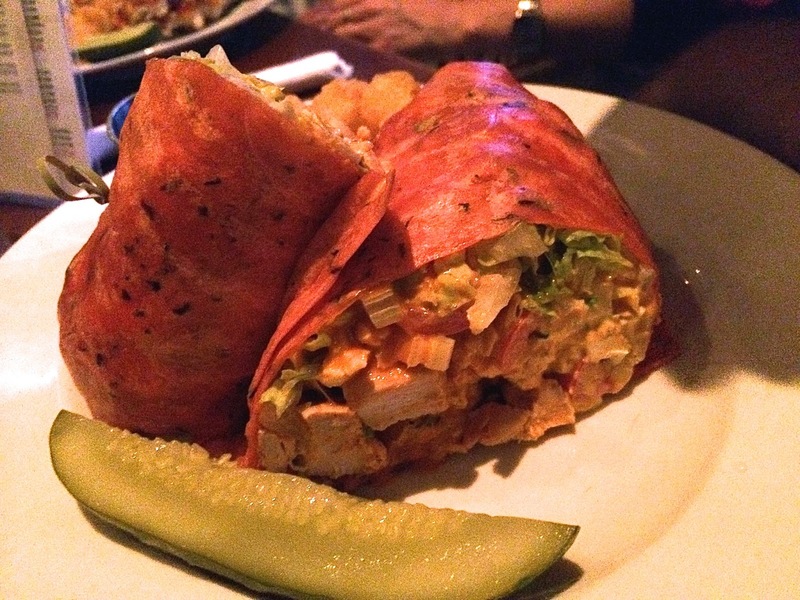 One of my buddies chose the buffalo chicken wrap. I unfortunately didn't get to try it, but it looked pretty good and had very similar ingredients. This one was the same tomato wrap, but instead was filled with grilled chicken, romaine lettuce, tomatoes, gorgonzola cheese, and both buffalo sauce and blue cheese dressing. It also came with a side of tater tots and a pickle. It is pretty difficult to mess up a buffalo chicken wrap, so I assume they didn't. Give it a try and let me know. - Come early before a game and get a few rounds of shuffleboard in. They have a great shuffleboard in the back of the bar. - Make reservations on OpenTable. They have several 1,000 pt. tables so you end up getting a little reward for just making a reservation (even if it isn't packed). - Don't expect plenty of draft beers; in fact, they have just a few... majority of their beers are in cans or bottles.